Random number generator using 8051. A random number generator using 8051 that displays a random number between 0 & 99 is shown in this article. 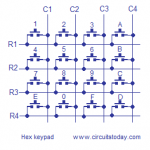 The circuit it self is very simple and may not find any applications in serious embedded projects and this article is just an illustration. The circuit is based on AT89S51 microcontroller, two seven segment LED displays, two transistors and few passive components. Circuit diagram. The two seven segment LED displays are multiplexed together and their data lines are connected to Port0 of the microcontroller. 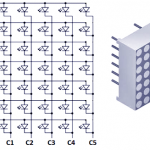 Transistors Q1 and Q2 drives the corresponding displays D1 and D2…. 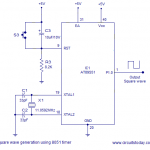 This article series is developed to teach you 8051 micro controller programming. I have divided this programming tutorial into a series of chapters as shown below. So you can start with Chapter 1 and then move to chapter 2 and chapter 3 and so on. So let’s begin the journey right now! Note: Next chapters 1,2,3.. are under development phase. Please visit this page again for updates. Note: To test any of these program or to write one your own and test, you dont need to buy a microcontroller board now. You can test your program using an 8051 simulator…. Ajantha Electronics store is Available only Ground Floor. Please reach us with +91-91764 16648 for further enquiries. Chennai - 600 002, Tamilnadu, India.